Darn!!! Just came up with a good Father's Day gift idea, but it is too late for this year (father's day is today and Amazon is not using drones to delivery product today). After seeing dad this afternoon I realized that I should have bought him a fishing vest. Obviously, it is best to get your father some sort of clothing. Electronics are way over rated. Also, it is good to get him something that he would not buy for him self often. Although I don't know your dad, my guess is that he does not buy him self a new fishing vest as often as he would get himself a new pair of shoes, t-shirt, or jeans. So, maybe a fishing vest surprise would be a novel idea. 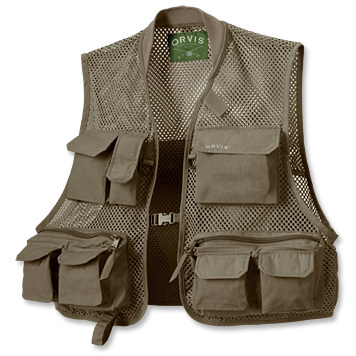 For example, this Clearwater Mesh Vest from Orvis, may have been a great choice. Even if you father is not a fan of fishing, possibly he can fill the pockets with something else. Or maybe he can learn to enjoy the sport of fishing. Although we missed Father's Day 2016 for this fishing vest gift idea, maybe we can keep it in mind for next year. Learn more about fishing vests in our new fashion production section.